King of the Britons, King of the Welsh, Prince of Wales, Prince of the Welsh, Prince [and king] of Gwynedd, of Powys, Prince of Aberffraw, Lord of Snowdon, of Ynys Môn, of Meirionnydd, and of Ceredigion. Not definitely provable. However, the most likely will be one of the descendants of Hywel ab Owain Gwynedd, who was his father's heir and oldest surviving son. Hywel ab Owain has existing male descendants in the 21st century, as can be confirmed by records at the College of Arms. There also exist other Welsh families who claim descent from other branches of the dynasty. The House of Aberffraw is a historiographical and genealogical term historians use to illustrate the clear line of succession from Rhodri the Great of Wales through his eldest son Anarawd. Anarawd and his immediate heirs made the village of Aberffraw on Anglesey (Ynys Môn) their early principal family seat. In the 10th century, Rhodri the Great had inherited Gwynedd from his father and Powys from his mother, and he added Seisyllwg (Ceredigion and Carmarthenshire) by a dynastic marriage to Angharad of Seisyllwg. Rhodri's influence in the rest of Wales was significant, and he left a lasting legacy. The family were able to assert their influence within Gwynedd, their traditional sphere of influence, but by the 11th century they were ousted from Powys (Mid Wales) and Deheubarth (West Wales) by a series of strong rulers from the House of Dinefwr in Deheubarth, their dynastically junior cousins. The Dinefwr family were descended from the second son of Rhodri the Great. However, Gruffudd ap Cynan Aberffraw was able to recover his heritage and position as Prince of Gwynedd from Norman invaders by 1100. Owain Gwynedd, Gruffudd's son, defeated King Henry II of England and the vast Angevin host in 1157 and 1166, which led to Owain being proclaimed as Princeps Wallensium, the Prince of the Welsh, by other Welsh rulers. This proclamation reasserted and updated the Aberffraw claims to be the principal royal family of Wales, as senior line descendants of Rhodri the Great. This position was further reaffirmed in the biography The History of Gruffydd ap Cynan. Written in Latin, the biography was intended for an audience outside Wales. The significance of this claim was that the Aberffraw family owed nothing to the English king for their position in Wales, and that they held authority in Wales "by absolute right through descent", wrote historian John Davies. By 1216 Llywelyn the Great had received the fealty and homage of the Dinefwr rulers of Deheubarth at the Council of Aberdyfi. With homage and fealty paid by other Welsh lords to Llywelyn at the Council of Aberdyfi, Llywelyn the Great became the de facto first "Prince of Wales" in the modern sense, though it was his son Dafydd ap Llywelyn who was the first to adopt that title. However, the 1282 Conquest of Wales by Edward I greatly reduced the influence of the family. King Edward I of England forced the remaining members of the family to surrender their claim to the title of Prince of Wales under the Statute of Rhuddlan in 1284, which also abolished the independent Welsh peerage. The Aberffraw family members closest to Llywelyn II were imprisoned for life by Edward, while the more distant Aberffraw members went into deep hiding and fell into obscurity. Other members of the family did lay claim to their heritage; they included Owain Lawgoch in the 14th century. Royal succession within the House of Aberffraw (as with succession in Wales in general) was a complex matter due to the unique character of Welsh law. According to Hurbert Lewis, though not explicitly codified as such, the edling, or heir apparent, was by convention, custom, and practice the eldest son of the lord or Prince and was entitled to inherit the position and title as "head of the family" from the father. This was effectively primogeniture with local variations. However, all sons were provided for out of the lands of the father, and in certain circumstances so too were daughters (with children born both in and out of wedlock considered legitimate). Men could also claim royal title through the maternal patrimony of their mother's line in certain circumstances (which occurred several times during the period of Welsh independence). The female line of the dynasty was also considered to remain royal, as marriage was an important means of strengthening individual claims to the various kingdoms of Wales and uniting various royal families to that of Aberffraw, or reuniting factions after dynastic civil wars (for example with the marriage of Hywel Dda, a member of the Dinefwr branch of the Aberffraw dynasty, and Elen of Dyfed, daughter of Llywarch ap Hyfaidd, King of Dyfed). This meant that the female line was considered as a legitimate path of royal descent within the House of Aberffraw, with the claims of royal women to titles usually transferring to their sons. Members of the House of Aberffraw would include Idwal Foel, Iago ab Idwal, Cynan ab Iago, Gruffudd ap Cynan, Owain Gwynedd, Gwenllian ferch Gruffydd, Llywelyn the Great, Llywelyn ap Gruffudd, and Owain Lawgoch. Succeeding surviving branches emerged and included the Wynn family of Gwydir. Hywel ab Owain Gwynedd (eldest surviving son after the death of Rhun ab Owain) Prince of Gwynedd 1170, succeeding as his father's chosen heir. Died 1170 in battle at Pentreath, against his brother Dafydd. The Chronicle of the Princes (Brut y Tywysogyon) records the following entry in the year 1170: One thousand one hundred and seventy was the year of Christ when Dafydd ab Owain slew Hywel ab Owain (Red Book of Hergest Version translated and arranged by Thomas Jones, 1955). See in genealogical tables in J.E. Lloyd's History of Wales: The Line of Gwynedd. Caswallon ap Hywel [see: PC Bartrum Welsh Genealogies AD 300–1400 (1974), page ref: Gruffudd ap Cynan 10]. 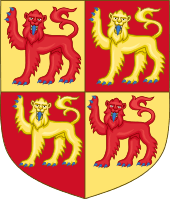 Caswallon has proven direct male ancestors who exist into the modern day and thereby represent the senior surviving male line of Owain Gwynedd – the genealogy of one family was recorded by Peter Gwynn-Jones, late Garter King of Arms, at The College of Arms. The Wynn of Gwydir family died out in the male line on the death of Sir John Wynn, 5th Baronet in 1719. Later direct male descendants would include the Wynn of Gwydir (disputed in a publication of 1884 entitled "Gweithiau Gethin" published by W.J.Roberts in Llanrwst.) and Anwyl of Tywyn families, claiming direct male descent from Owain Gwynedd and bearing his coat of arms. The Wynn baronets of Gwydir were created in the Baronetage of England in 1611—one of the initial creations—for John Wynn, of Gwydir. The family continued to be prominent in politics, all the baronets save Owen sat as members of parliament, often for Carnarvon or Carnarvonshire. This creation became extinct in 1719, on the death of the fifth baronet. Wynnstay, near Ruabon, passed to Sir Watkin Williams, who took the name of Williams-Wynn. Jane Thelwall (great-granddaughter). Her husband took the name Wynn in honor of his wife's heritage, establishing the Williams-Wynn family. A cadet branch of descendants could trace their descent from Richard Wynn, through his daughter Mary Wynn, Duchess of Ancaster and Kesteven, and his great granddaughter Priscilla Bertie, 21st Baroness Willoughby de Eresby. This cadet branch would expire with the 1915 death of Willoughby Merrik Campbell Burrell, 5th Baron Gywdyr. Thomas Lloyd Anwyl of Hendremur (1695–1734); married Margaret, daughter of Thomas Meyrick, and died 1734. William Anwyl of Hendremur (1717–1751) = Margaret, daughter of Rice Pierce, of Celynyn. Rice (Rev) Anwyl (1740–1819) = Margaret, daughter of David Roberts, of Goppa, and died 1819. David Anwyl of Bala (1771–1831) = married Mary, daughter of Gruffyd Owen of Pencader. Evan Anwyl of Llugwy (1789–1872) (brother of Robert) = daughter of William Morgan, of Brynallys, Montgomeryshire. Robert Charles Anwyl of Llugwy (1849–1933) = Harriette daughter of William Hamilton. Evan Anwyl of Ty-Mawr Farm, Tywyn, Merionethshire (1858–1955) = Sarah daughter of Jonathan Benbow of Meifod. Evan Anwyl of Ty-Mawr of Tywyn (1911–1968) = Gwyneth daughter of Harold Henry Scott of Chester. David Evan Anwyl (born 1977). Two grandsons of Jonathan the younger brother of Evan Anwyl (b. 1858) are also extant and live in Surrey. Philip (b. 1943) and Roger (b. 1947). 1 2 3 Lewis, Hurbert; The Ancient Laws of Wales, 1889. Chapter VIII: Royal Succession; Rules to Marriage; Alienation pgs 192–200. ↑ Maredudd ap Hywel had two sons; Robert and Ieuan. The Wynn of Gwydir family claim descent from Robert while the Anwyl of Tywyn family claims to descend from Ieuan. Gwynfor Jones, J The Wynn family of Gwydir. Aberystwyth : Centre for Educational Studies, 1995. Wynn, Sir John History of the Gwydir family and memoirs. Edited by J. Gwynfor Jones. Llandysul : Gwasg Gomer, 1990.